Recently had a minor problem with a form in CRM 2011 which I have resolved while trying to fix something else (isn’t that so often the way?). 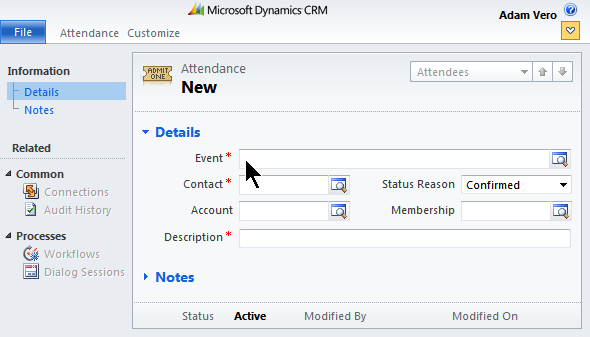 I created a custom entity in CRM 2011 to use as a joining entity in a manual N:N relationship. In this scenario it was an “Attendance” record to link a Contact to an Event, and enable the business to track the status of the attendance (tentative, confirmed, attended, cancelled) along with relevant dates etc. To reduce effort on the user’s part I made the primary “description” field on the record auto-filled based on the event and contact name, using jscript web resources. To observe sensible UI practice, I made sure the lookup fields came at the top of the form, then the description which was a result of those, so it should be obvious to the user what to fill in first, then by the time they get to the name field it is already filled in. A blank new record form is shown below. When the user creates a new record, they expect to be able to get on with the job of typing in the fields. Although the Event or Contact was automatically filled in if they created the record from the context of the parent record to make life even easier, this still means that sometimes they needed to fill in one or the other field, and that’s where it got strange.